Westbrook Villas at Savannah Quarters is an active lifestyle community in Pooler, Georgia offering great low-maintenance living. This gated neighborhood is part of the master-planned community of Savannah Quarters. With great resort-style amenities in a beautiful coastal setting this is a perfect community for the active adult homebuyer. 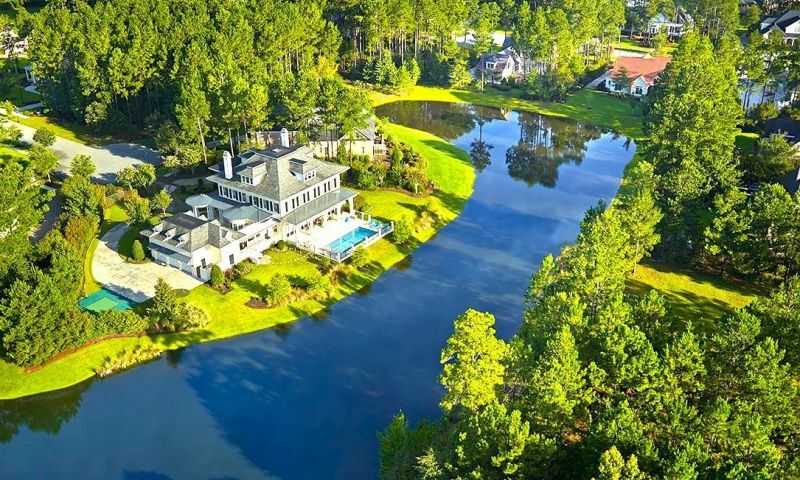 Although Westbrook Villas does not have its own amenities, homeowners in the community can purchase a membership and have full use of all amenities in the Savannah Quarters Country Club. Residents can work out in the well-equipped fitness center, hang out in the activities room, join friends for a few games in the card room or billiards room, or grab a bite to eat in one of the three dining rooms. There is also a conference room, wine room, and ballroom. Outside of the clubhouse homeowners enjoy a Junior Olympic lap pool and a wading pool with a water slide. They can also relax on the spacious patio, enjoy a meal or meet with neighbors for a drink or read a book at the outdoor terrace. Two tennis courts and miles of walking trails also keep residents active while getting fresh air and scenic views of the community's pond. Homeowners can also play a few rounds of golf at the 18-Hole Greg Norman course and pick out new gear at the golf pro shop. Afterwards, when the grandkids come to visit, they can spend some quality time having fun at the playground. Started in 2010 by Shore-Blanton Construction, Westbrook Villas at Savannah Quarters plans to build 92 low-maintenance residences. These homes are currently available on a new or resale basis. Homebuyers can choose between two floor plans and each model can be built as an attached villa or single-family home. The Olgethorpe floor plan offers at least two bedrooms, two bathrooms and an attached two-car garage in 1,955 square feet of living space. An optional second floor could add up to two bedrooms and a bathroom. Functional eat-in kitchens and back patios are just a few of the great features of this model. The Habersham floor plan offers at least three bedrooms, two bathrooms, and an attached two-car garage in 1,964 square feet of living space. An optional second floor could add up to two bedrooms and a bathroom. Both of these models were designed for active adults with open floor plans and large master suites. Residents of Westbrook Villas at Savannah Quarters enjoy an active and low-maintenance lifestyle. An annual homeowners' association fee covers maintenance of all amenities and common areas, as well as the lawn care and exterior-home maintenance. This lifestyle allows homeowners the opportunity to enjoy their time more and work a little less. There are numerous clubs and activities planned at Savannah Quarters. Swimming classes, cooking classes, book clubs, happy hour, golf tournaments and exercise groups all meet regularly in the clubhouse. Planned day trips to local beaches and other attractions are favorites among residents. There is something for everyone at Westbrook Villas at Savannah Quarters. Located in Pooler, Georgia residents of Westbrook Villas at Savannah Quarters enjoy a beautiful location. The surrounding area offers a myriad of opportunities for shopping, dining, and entertainment. With close proximity to both I-16 and I-95, travel to other parts of Georgia is a breeze. Hilton Head, South Carolina is just 30 miles away and is a favorite local destination for day trips among residents of Westbrook Villas. A low-maintenance lifestyle in a great location makes Westbrook Villas at Savannah Quarters a prime community for active adults. Although Westbrook Villas does not have its own amenities, residents are able to purchase a membership to use the amenities in the Savannah Quarters clubhouse. Clubhouse - 29,000 Sq. Ft. There are plenty of activities available in Westbrook Villas at Savannah Quarters. Here is a sample of some of the clubs, activities and classes offered here. These models can be built as an attached villa or single-family home and offer between 1,955 and 1,964 square feet of living space. They have two to five bedrooms, two to three bathrooms, and an attached two-car garage. Homebuyers can add an optional second floor for extra space. Open floor plans and low-maintenance exteriors makes these homes perfect for active adults. We wanted a hassle-free home that would allow us more flexibility to travel and spend weekends visiting our kids and grandkids and found that in our home here. We can just lock up and leave without having to worry about things that need to be done around the house. We also love the location because getting to Hilton Head for a weekend every so often is a breeze. Savannah Quarters has great amenities so when we are home there is plenty to do and lots of great people to get to know. Moving here was a hard decision but it's been great. 55places.com is not affiliated with the developer(s) or homeowners association of Westbrook Villas at Savannah Quarters. The information you submit is distributed to a 55places.com Partner Agent, who is a licensed real estate agent. The information regarding Westbrook Villas at Savannah Quarters has not been verified or approved by the developer or homeowners association. Please verify all information prior to purchasing. 55places.com is not responsible for any errors regarding the information displayed on this website.